With everyone downsizing engines and adding turbochargers, in the search for lower emissions and higher efficiency, Maruti-Suzuki has gone and done the opposite. The facelifted Ciaz, along with updated cosmetics, gets a marginally larger 1.5-litre petrol engine. And for the first time ever on a Maruti petrol, the Smart Hybrid system (SHVS) as seen on select diesel models. 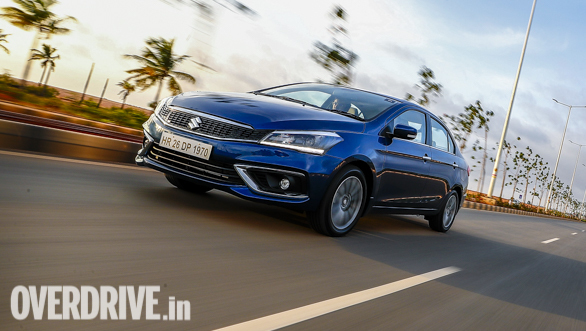 Does everything come together to make the fresh-er Ciaz a better car, both to own and to drive? It's a mild hybrid with mildly refreshed styling. Immediately noticeable is the wide, slim grille, which does improve the face of the Ciaz marginally. From there, the shapes of everything remain the same, but small bits have been chromed or re-appropriated to make the new Ciaz look, well, newer. It has to be said though, only the top-end Alpha variant like the one we have on test benefits from the full makeover. Lesser models still use the same headlights, tail lights and black plastic cutouts on the bumpers. Not vastly different here either, with the standout element being the lighter wood-ash plastic trim across the dual-tone dash. 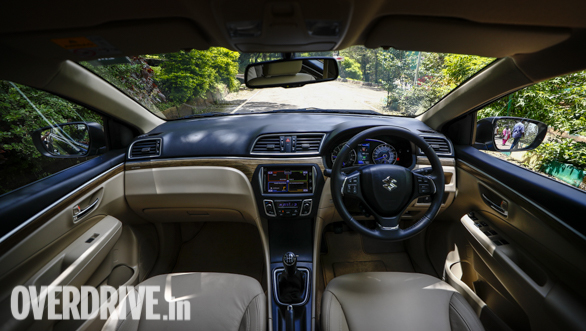 The Ciaz was already available with the SmartPlay infotainment and reversing camera, but what is new is the colour 4.2-inch display between the dials, borrowed from the Baleno. Apart from showing little dials with real-time power and torque outputs, and efficiency information, it also shows you just how the Smart Hybrid system works. Space is easily the selling point of the Ciaz with large comfortable front seats, and a plush rear bench. Legroom in the back will be most appreciated, though headroom isn't the best since the seats seem a little high set. Ergonomically, the front cup holders feel a little too far forward, and Maruti-Suzuki should have offered more than the standard two airbags on the top end variant. 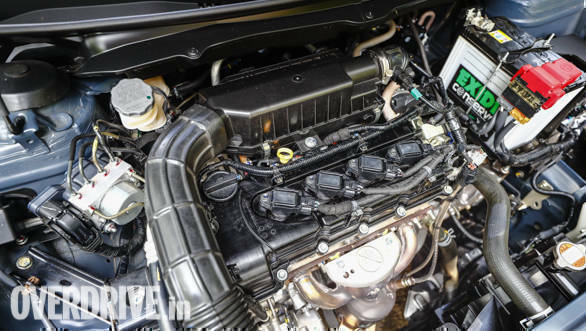 So the most noteworthy change on the Ciaz is it's new 1,462cc K15B petrol engine, with an updated Smart Hybrid system that uses an additional lithium-ion battery for deeper charge/discharge capabilities, resulting in being useful more often. The engine itself is very quiet and refined, but so much so that it's probably verging on the edge of too mature in character for my tastes. For a comparatively large engine, it doesn't have the outright bottom end you'd expect, instead offering just enough to get the job done. No harm there,I suppose. If you really want to add some excitement to your commute, you will have to rev it out but the motor does that willingly, feeling most alive between 2,500-5,500 revs. It did prove to be surprising in the 0-100kmph dash, posting a time of 10.2 seconds. Importantly, the Smart Hybrid system does work. It's seamless in its operation, though you might find yourself switching it off on a warm day, as the air-conditioning reverts to blower mode when you're in traffic. This gets noticeable only if you happen to be in the same spot for over five minutes or so. By which point the you've already saved approximately 10ml of fuel, something I know because of that aforementioned 4.2-inch display. 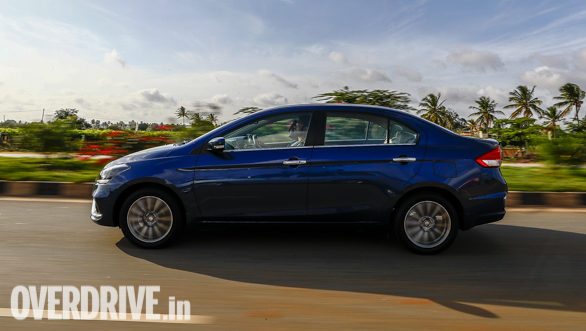 The Ciaz proved to be exceptionally frugal on the highway, at 21.9kmpl. While surprisingly in the city where you'd expect the mild hybrid to make the most difference, the Ciaz managed 12.8kmpl. Both are very good figures for such a large car. You can also feel the Smart Hybrid regenerative braking at work if you pay real close attention. As a result, the brake pedal offers the driver a good amount of modulation but doesn't always feel the sharpest. 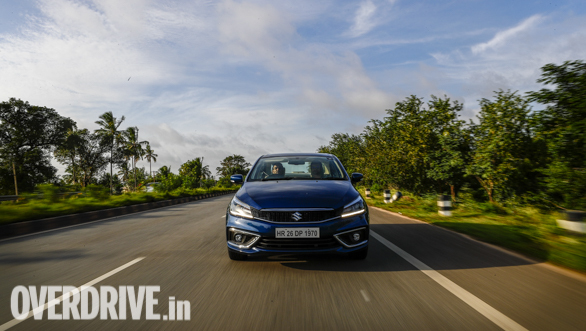 Much has been spoken about the ride and handling of the Ciaz already but what you need to know is that it's comfortable and very confident in the way it tackles bad roads. The suspension is set up on the soft side, but we noticed that the extra degree of plushness we loved went away when the tyres are inflated to the recommended pressures. Make of that what you will. A steering that's heavy at low speeds adds up to the perfect weight for city and highway speeds. It's not very communicative but the plus point is that it never feels fidgety or nervous. It also means that the Ciaz doesn't like being thrown into corners, and takes some doing to get its 4.5m length rotated through a corner. For the odd burst of enthusiasm, it's fine. 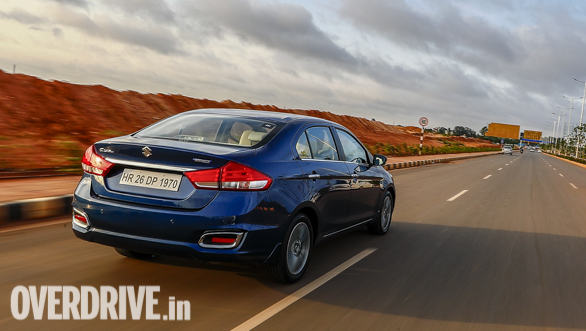 But a calm and serene experience is what the Ciaz does best. The top-end Alpha petrol variant comes in at Rs 9.97 lakh, ex-showroom, Mumbai. For that price you do get a lot of car. The few areas we would hope to see improved, maybe in a plus variant, is in more airbags on offer.